Affilorama Affiliate Program Review: This One Passes the Test! Affilorama is a platform for affiliate marketers. They show you how to start your own online business right from setting up your website to how to do internet marketing. Affilorama has been around since 2005. Mark Ling is a well known and respected internet marketer. He previously owned Rocket Piano and Jamorama before launching Affilorama. He currently also owns Travis Traffic. Some of the training is outdated and I don’t recommend it all because it can be detrimental to your online business! With the free program you get some free lessons which is great, but bear in mind that these really are the bare minimum and won’t get you very far! With the Premium Membership you get more training, interviews with successful affiliate marketers and bootcamp videos. You also get access to tools that will help you build your business. Affilotools comes included in the Premium Membership and includes a keyword research tool, monitoring of keywords and rankings and a link finding tool. 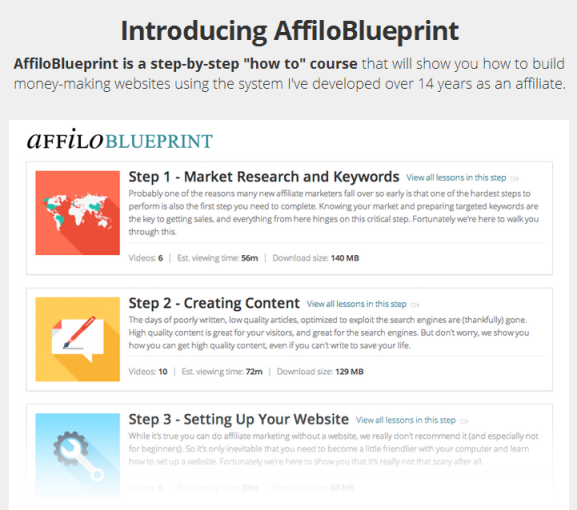 AffiloBluePrint is a step by step course that teaches you how to build your website from scratch and start earning money from affiliate marketing. It is broken down into 12 modules and each module includes video tutorials, pdf notes and homework. Mark Ling claims that by following this blueprint you will have a website and traffic by the time you have completed it. There is a 60 day 100% money back guarantee with no questions asked. Now normally that would do nothing for me personally because I don’t trust people easily. However Mark Ling is well known and respected, I can’t see him offering a money back guarantee lightly! 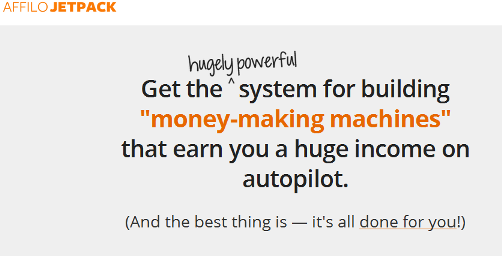 AffiloJetPack is a system for building a website that will make money for you. It is a proven formula that will do all the work for you, you just have to follow the instructions. So what do you get with the AffiloJetPack? 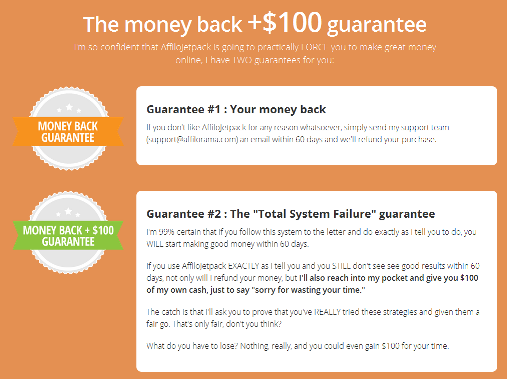 And Mark Ling is so confident that you will be making great money with his AffiloJetPack that he offers not just a 60 day money back guarantee but he will actually give you $100 too for wasting your time! I’ve never seen that offered before. There is support available via email and on their forum. Can you make money from Affilorama? Yes you can make money from Affilorama, as with any business that you start remember to bear in mid that this is NOT a get rich quick scheme. This will take work and time to get off the ground. No, I rate this as a 100% legit program. Overall I really like Affilorama. This is a great product, it offers the training, support and tools that you need to start an affiliate marketing business. Mark Ling is an upstanding and well respected internet marketer that offers a great platform here. I also like the fact that he offers 100% money back guarantee if you are not satisfied and I believe you can trust him to actually stick to that! The down side is that I don’t agree with some of the marketing tactics he uses, such as the emphasis in backlinks. This is an outdated method and can actually cause harm to your business now. I love your review, it’s very in dept and honest. It’s easy to follow and easy to read too. 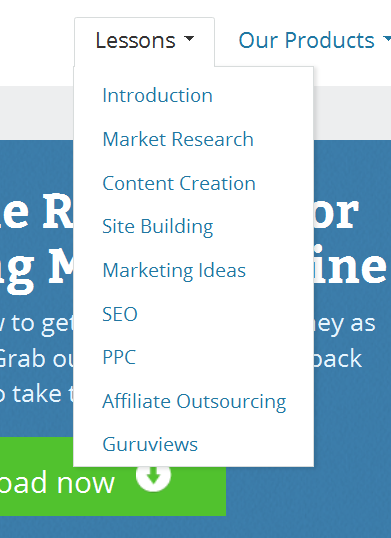 Very helpful for people looking to embark on an Affiliate Marketing course. Personally, I went with your no1 rec of Wealthy Afilliate – I found a review over a year ago and I haven’t looked back. I have my online business set-up and I continue to learn every day. Hi Olive, I am glad you enjoyed my review of Affilorama. They are great but there is a reason Wealthy Affiliate is my first recommendation 🙂 I’m glad you are enjoying your online business. First thing that jumps out at me is this could get quite expensive, couldn’t it? Most people looking to start an online business don’t really have as much disposable income to spare. But for those who can, seems like a good program to try out. Hi May, yes that really is the downside – it is very expensive and not everyone can afford that or even if they can will be prepared to pay that amount of money. I visit your website quite often as it gives honest review. Thanks! I have often heard about Affilorama Affiliate program and I have seen mixed information about it. This article provides me a very good insight about the program and I could just take it as my main reference to whether if I should sign up. After reading through the review, I think it offers too many upsells in which I am not a big fan of it. I have been there (with other programs), and I was very disappointed. I wasted lots of money before I earned my first penny. I think I will skip this program. 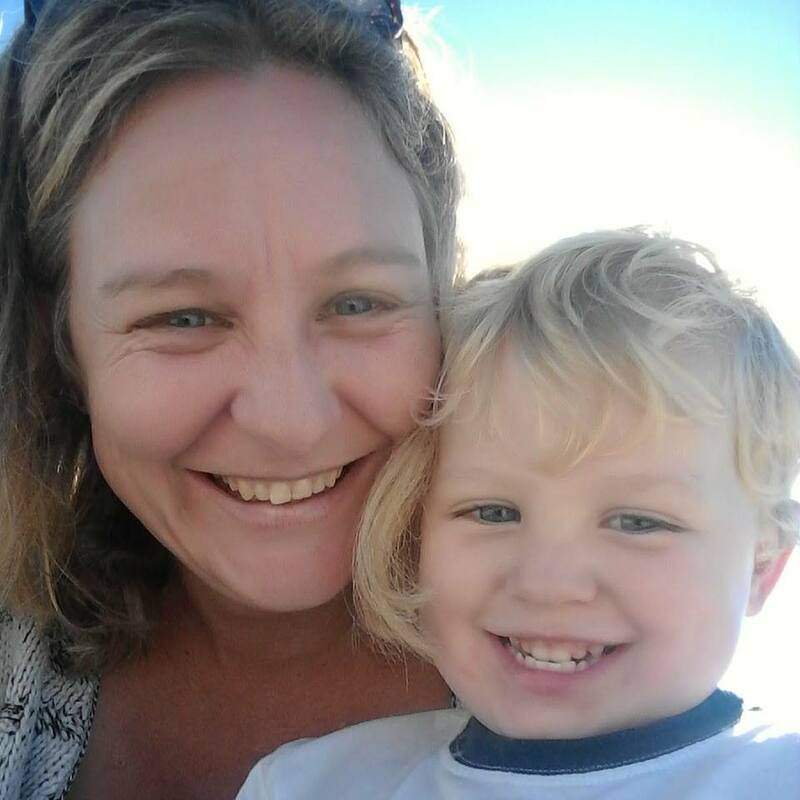 Hi Alex, it is a nice enough program BUT the thing is there are better programs out there, that teach up to date methods of internet marketing that won’t damage your business, plus for much cheaper. So yes I like it for what it is, but it is not the best. Thank you Lynne for your in depth review and honest opinion. I have come across Affilorama in my past research but didn’t look to far into it. It is great that explained all the tools they provide. It is nice to know what you are getting for your money before you spend it. Is it possible to get far with the free membership or is fairly restrictive? I am curious if they have an affiliate program that can be beneficial to someone who decides to stay with the free membership. Hi Melody. I honestly don’t think you can do much with the free membership, especially as a newbie. You will need guidance and training. They only provide the bare bones of training to get you started on the free membership, then you are left hanging. If you are looking for something for free then go for the Starter Membership at Wealthy Affiliate, you can build an online business there at no cost. When I first joined Affiliorama, I thought it was a very neat program. Everything was laid out professionally and the tutors were quite presentable. But moving forward, I was taken back by the enormous upgrading fee. When I see $997 for AffiloJetPack, I start to question if I really need to pay that much to start an online business. Fortunately I did some research and ended up in Wealthy Affiliate where I have been a member for more than a year now. Given the tools and training that I am benefiting, I find the program fee to be very affordable. Hi Cathy, yes that is exactly my impression. It is a nice enough program but works out to be very expensive! That is why Wealthy Affiliate is my #1 recommendation! I have heard about affiliorama when researching affiliate marketing. Thank you for the in-depth review, it is very helpful. There are so many different programs to “help” you get started in this business it is a tiring process trying to find the right one. Your detailed and honest description is a great help in finding which program will be the one for me. I have been scammed before so now I am very cautious before I jump into anything. Hi Heather, as so many of us have been scammed! It is so sad that we have to be so wary online. Yes this is a nice program and it is legit but there are some negatives like the high cost. I’m glad I could help you with your research. First off I would like to say that this is a very nice review! It is easy to read, well sectioned, and it is to the point without including too much filler. It tells me all of the pertinent information yet doesn’t come across to me as boring or monotone. I guess maybe a good way to put it would be to say that it shows professionalism without lacking character and style. Kudos! The only question that I have for you would be in regards to clarify the pricing for the affiloblueprint and affilojetpack. Is the pricing on those two Items a one time fee or annual? I would have to guess that they are not monthly but I don’t care to make assumptions if I can help it. Thanks Lynne, and again; Great job putting together a straight forward and comprehensible review with some personality! Hi Zach, thanks for your feedback 🙂 The AffiloBluePrint and AffiloJetPack are once off costs, the Premium Membership is monthly. I am glad you enjoyed this review on Affilorama. This is a great review on Affilorama! I was once a member of Affilorama for a short period of time, but it just wasn’t for me as it didn’t suit my needs. Some of the training wasn’t updated, and there were 1 or 2 tools that are bad for online business these days! Hi Neil, thanks for sharing your personal experience on Affilorama with us. Yes I had a few concerns about the methods that are taught! Hi Ehab, yes I am sure you can earn that back quite easily if you put your mind to it. My only thought about it is that I am sure you can get the same and more for much less! Very in depth and useful review of the Affilorama Affiliate Program. It does sound a lot more honest and straightforward than a lot of those scams out there. Mark Ling is a respected marketer and I think has been around for years. My only problem is the upsells. I know for one that I couldn’t possibly pay out $997. Apart from promoting backlink, they also promote copying other people’s articles. Both these are taboo as far as Google is concerned and will not help your site ranking. I am very glad I found Wealthy Affiliate as you get all that Affilorama offers but just for one monthly fee. Interesting review though and it is pretty legitimate. Hi Lucinda, thanks for your feedback, yes this is exactly it. Some of the training can really be detrimental and the sad thing is if you are new to working online you won’t even know that those techniques are black hat! Very good review on Affilorama. This program can be and will be too expensive for some of us that doesn’t have the money to invest as their requirements or the need that you must have to promote your business. Hi Brenda, glad you enjoyed my review. Yes the costs of Affilorama affiliate program certainly count against it! Very good review . You have it sectioned and all in order . Very well presented . I am too hooked on Wealthy Affiliate . We get more benefits and cost us less. Hi Brenda, thanks for visiting and for sharing your experience! I have never heard of Affilorama Affiliate but I’ve been wanting to start a business online for sometime now. Your review was very detailed. Affilorama Affiliate seems a little expensive and I don’t like the fact that they are using outdated methods of marketing sites. I gave a look to your # 1 recommendation and it seems like a better deal. Thanks for the in-depth reviews. Hi Merceadez, I’m glad you enjoyed my review of Affilorama. They are good and Mark Ling is a great and well respected internet marketer. Like you say the biggest downside is that some of the marketing techniques they teach are outdated which is really not good. However if you look at Affilorama in comparison to most of the the opportunities to find online they really are quite good! This is a fantastic and comprehensive review of what is Affilorama about. I have read other reviews and looked at the program myself, but this one is very clear and sets it out, a lot better than they do on their website, which I found it really difficult to understand what is what. It does sound like a really good training course, I did sign up for free a while ago, but one of the first videos I watched, about 40% of it was an upsell to the afiilojetpack, I can’t even remember how much it cost, but it was close to $1000, I can’t afford that on a risk!. Although the idea of having everything done for you is really interesting. Do you think that could actually work? Hi RuthM. Thanks, I am glad you enjoyed my Affilorama review. I totally agree with you, I don’t enjoy upsells at all. I like something that is all inclusive so you know right from the beginning what you are getting. If you read my info on what is Affilojetpack you will see that there are some lovely things included. The free eBooks and covers looks great to me. That is something I am busy trying to get done for this website. Newletters written for you – once again awesome. The only downside is that if these newsletters and eBooks are “done for you” they are not done just for you, they are done for everyone else that buys AffiloJetPack. So then they are not unique and special are they? The Ebooks are also not your property are they? You can also have your domain, hosting and theme installed within minutes elsewhere, and for free! So yes some of the things in AffioJetPack look great but they are not that unique and you can do most of those things yourself and for free! You just need to know how to go about it. Thanks for your review , honest and to the point. Overrall it looks legit , on top of that you get a refund and 100$ extra dollars , that sounds convincing about this system however in my humble opinion , those prices are just too high for the average person obviously building a business takes some risks but being the packs so expensive could drive away people. Hi Alan, it is a good program and totally legit. However like you say it gets pricey which is why this is not my first recommendation! Have a look at my #1 Recommendation, you can get started for free! I enjoyed your review on Affilorama. I thought you conveyed an honest and easy to understand view point. It appears that Mark and his team have done a lot on their offerings however, it is to bad that they can’t just charge one flat fee instead of all of the up sells. Hi Dwayne, yes I also like a set monthly fee that includes everything instead of upsells. It really is a pity about that because this truly is an honest program. If they got rid of their upsells and updated some of their training they would be competing with the top online training programs easily! I found your #1 reccommendation and I to have not looked back, it is a great place! Thanks for your feedback and I am glad you enjoyed the review. Very helpful article here. I love the layout and how everything flows. As an affiliate marketer its great to see the attention to detail and see how you really picked out every good thing and every bad thing about the program. The format was very easy to follow and I was able to follow the article very smoothly. Thanks for the great read. Affilorama would cost too much for me, but this program may be perfect for someone else that has a bit more capital. Cheers for the info and the hard work you put in for us. So glad I could help you out! Yes I agree with you Affilorama is a bit pricey for what you get. Have you checked out Wealthy Affiliate yet? Thank you so much for this review. I needed this information as I was looking into this business. It’s not always clear when we look on their website. Of course there are only great things that are said, it’s their website, right? You give great information in your review. I actually thought that they were a scam, now I realize that they ARE NOT! Quite right, they are not a scam… but not the best either. I am so glad I could help you. I want to share my experience with them. I think your review is spot on. Is not a scam and is worth attention to get some training for them, $1 is not much to join them for a month. I did as well for my research and as I am a member of Wealthy Affiliate I can say that Affilorama is very similar, and I guess the owner make it look like Wa for a reason that one day they will be huge like Wealthy Affiliate. But the lack of live support and upsells like you mentioned are putting down. I hate upsells is remind me being a member of Empower Network and Multi-Level Marketing. I did get a lot of info for them for $1 but I will not pay premium as I agree with you Wealthy Affiliate can give you so much more for less money and with great community. I am glad you got something out of Affilorama, they are a good and legitimate place to learn about working online. Thank you for sharing your experience with us. I have never tried Affilorama before but I know of a couple of people that are making a lot of money from their training. It is also the first time that I have heard about the Affilotools. It is great that they have their own tools and that you do not need to buy tools outside the program. There are many similarities between Affilorama and Wealthy Affiliate. Thanks for adding value to this Affilorama review. Yes Affilorama are a great place to learn about working online, like you say they are very similar to my #1 recommendation. What I really enjoy is the free membership and the $1 trial for the Premium membership so you can see what is being offered before you pay the full price. I must agree with you that Affilorama is a great place to get started for an online business. I joined for free never paid for the premium membership. I use the affilotools to check my website health, keyword research and that kind of stuff. really enjoyed your review. keep it up! Thank you for sharing your experience with Affilorama 🙂 I’m glad you like them as much as I do! Thank you, I am happy to help. Yes Affilorama is great, but you are already with the best! Awesome site! I love it! Thanks for the new platform. I already use wealthy affiliate as well as IBO but this also sounds promising. I will give it a shot like I do all good money making options. All good marketing comes from peoples who know, like, and use thier product and you know about affilorama! thank you for the info! It is a pleasure and yes I highly recommend that you check out Affilorama and see what they have to offer. Wealthy Affiliate is in my opinion the best by far, but no harm in checking out what everyone else has. Affilorama is a great product too. Very in depth review of Affilorama, this helps people make informed decisions before buying into a program they’re unsure of. Thank you for providing such great detail on this program. How does Affilorama compare to your #1 recommendation? Is it worth doing both? Or would you suggest sticking with one over the other and why? Great question 🙂 I would go with Wealthy Affiliate only, they really have so much more to offer. There is so much training that you will never even get through it, with new up to date training being added daily. The community support and activity is also unmatched… it is a no-brainer for me which is better here! I love this deep and honest review of affilorama. I am left a little unsure of what it is exactly. Affiliate marketing training using quality content as the vehicle to establish oneself in a market sector and bring in sales right? About the website design part, how good is the training? and how difficult is it to build a site for a non-techie type of person? Yes affiliate marketing is when you create quality content on your website and drive sales to an external company that you have affiliated with and then you earn commissions. Yes Affilorama is good and they are good for “non-techies” like me! But the best training by far is with Wealthy Affiliate.